The leaves from a medieval pocket Bible were written in Latin Gothic micro-minuscule script with approximately ten lines per inch. 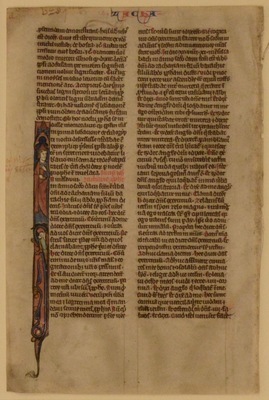 This leaf contains text from Aggeus 2:10 - Zacharias 1:21, as well as contemporary writing inscribed by in the bottom margin by an early owner of the book. The miniature portrays the Prophet Zechariah standing in a Gothic architectural niche and holding a book with a hybrid creature beneath him.